Steel specifications vary from country to country and can be based on differing criteria, majority of them being defined in the terms of the chemical composition of the steel. For an experienced engineer, the composition indicates a heat treatment that can be given to the steel and the corresponding mechanical properties obtainable. 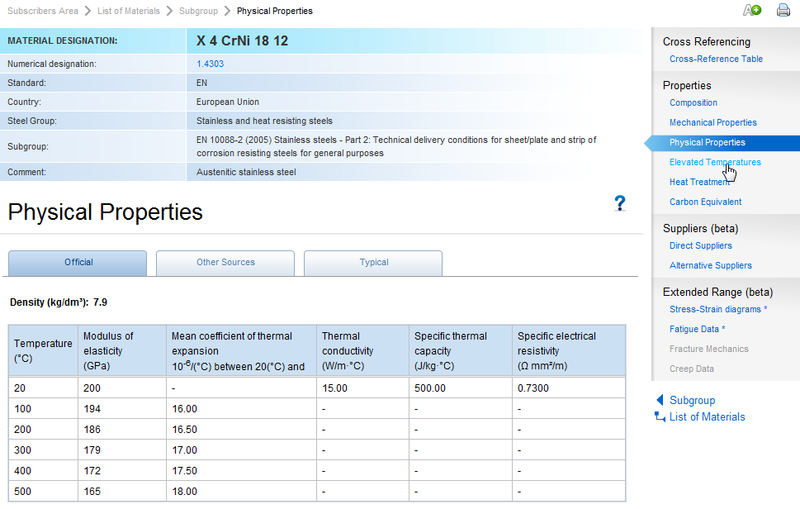 Alternative criteria based on mechanical properties or hardenability are also used to specify steels. The term “steel specification” is very often closely related to standards and being used interchangeably, although their meaning is not really identical. Hence, German steel specifications often start with the letters DIN, Japanese with JIS, international with ISO etc. The most widely used standard steel specifications in the United States are those published by ASTM; these steel specifications represent a consensus drawn from producers, fabricators and users of steel mill products. In many cases, the dimensions, tolerances, limits and restrictions in the ASTM specifications are the same as the corresponding items of the standard practices in the AISI steel product manuals. Many of the ASTM specifications have been adopted by the American Society of Mechanical Engineers (ASME) with slight or no modifications. ASME uses the prefix S with the ASTM specifications; for example, ASME SA 213 and ASTM A 213 are the same. 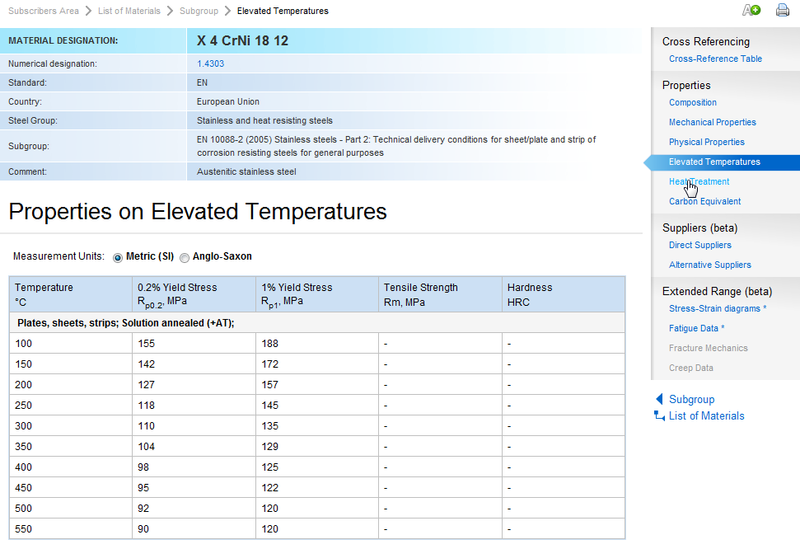 SAE/AISI designations for the chemical compositions of carbon and alloy steels are sometimes included in the ASTM specifications for bars, wires, and billets for forging. 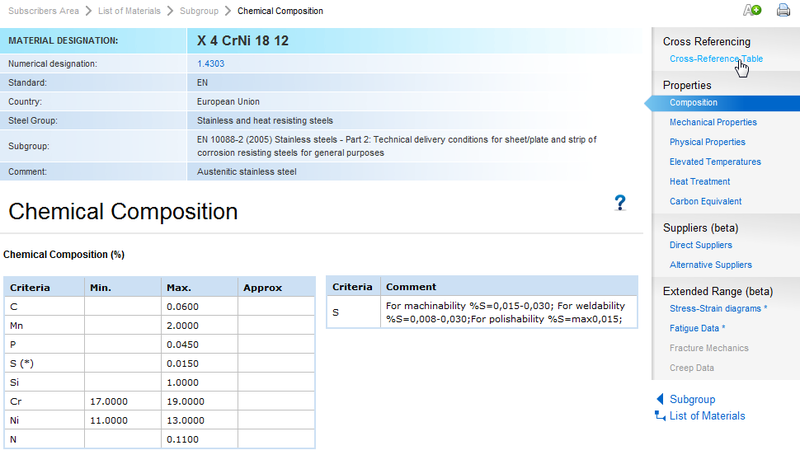 Some ASTM specifications for sheet products incorporate SAE-AISI designations for chemical composition. EN (Euronorom) is a harmonized system of European countries. Although it is accepted and effectively used in all European countries, “obsolete” national systems, such as German DIN, British BS, French AFNOR and Italian UNI can still often be found in many documents. DIN standards are developed by Deutsches Institut für Normung in Germany. All German steel standards and specifications are represented by the letters DIN and followed by an alphanumeric or a numeric code. Examples: DIN 40NiCrMo66 or 1.6565 is a Ni-Cr-Mo steel that contains 0.35-0.45%C, 0.9-1.4%Cr, 0.5-0.7%Mn, 0.2-0.3%Mo, 1.4-1.7%Ni, 0.035%S; DIN 17200 1.1149 or DIN 17200 Cm22 is a nonresulfurized carbon steel containing 0.17-0.245C, 0.3-0.6%Mn, 0.02-0.035% S and 0.4% max Si. JIS standards are developed by the Japanese Industrial Standards Committee (JISC) in Tokyo. 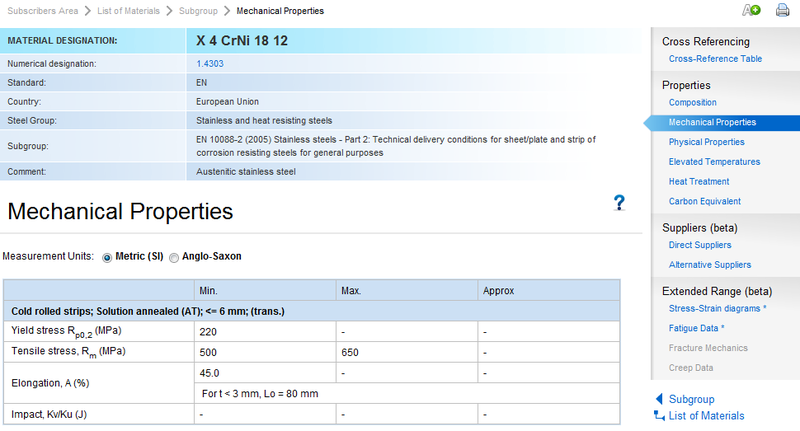 The specifications begin with the prefix JIS, followed by a letter G for carbon and low-alloy steels. Examples: JIS G3445 STKM11A is a low-carbon tube steel containing 0.12%C, 0.35%Si, 0.60%Mn, 0.04%P, 0.04%S; JIS G4403 SKH2 (AISI T1Grade) is a tungsten high-speed tool steel containing 0.73-0.83%C, 3.8-4.5%Cr, 0.4%Mn, 0.4%Si, 0.8-1.2%V and 17-19%W. 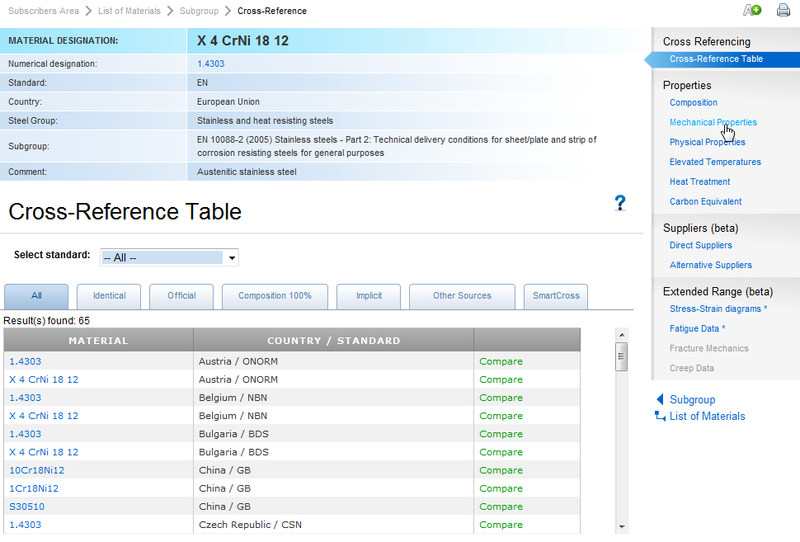 Finding a steel alloy and specification in the database is very easy and takes seconds. 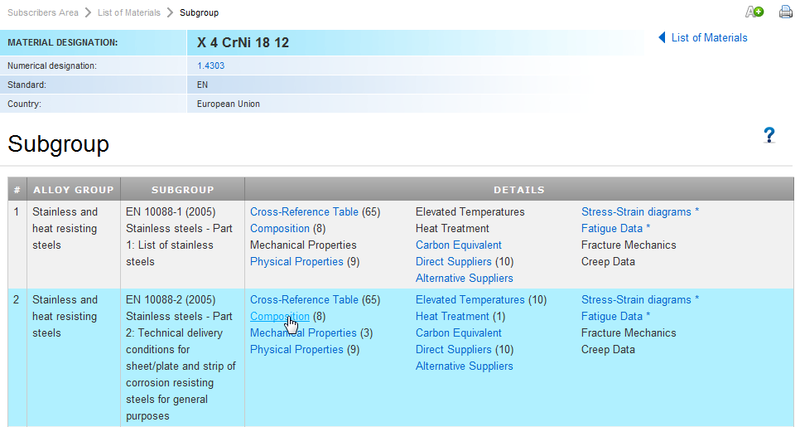 For example, let’s look into the properties of steel grade X 4 CrNi 18 12 according to Euronorm (EN).